Spectatators line the parade route during Saturday’s Summer Celebration and children wave at American Legion members in their passing truck. The Mechanicsburg High School Marching Band brings music to Main Street during Saturday’s Summer Celebration Parade. Antioch Shriners drive their tiny cars in circle patterns during Saturday’s Summer Celebration Parade. Homes on Main Street are manicured and displaying the American flag near the downtown prior to Saturday’s parade. Lines of antique tractors are always a hit in the annual parade. 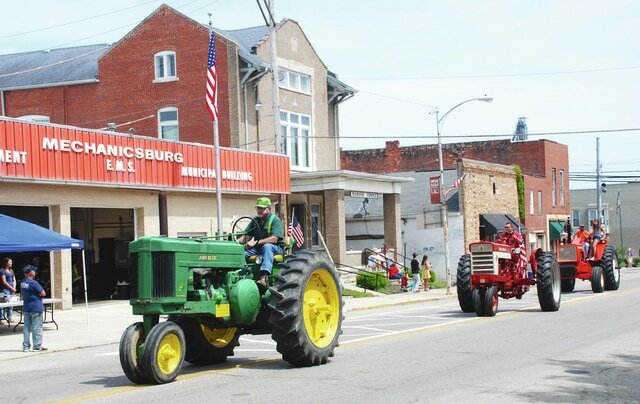 MECHANICSBURG – The village of Mechanicsburg held its annual Summer Celebration on Saturday. The event is to commemorate Independence Day. Residents of the village orchestrated a parade through the downtown to Goshen Park, where there were activities and concessions on Saturday evening. The Grimes Flying Lab, based in Urbana, staged a flyover prior to the parade. Fireworks were displayed at dusk on Saturday.